Last year, I did a little research to find out the exact cost of running a magicJack plus original model. For the 2012 model, it cost $2.41 per year. 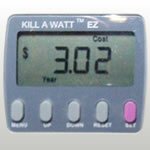 I used the Kill-A-Watt EZ to determine the exact amount based on the average cost per therm for the previous year. This year, assuming the average cost per therm has not changed, the 2014 model comes in at $3.02 per year. That’s $0.61 more per year than the 2012 original plus model. What are we getting for the extra cost in power? I cannot be certain, but the device has to be able to power a REN of at least 2 or 3 and perhaps a USB phone adapter and SDIO card. It remains to be seen whether there will be a need for additional electrical for power to SDIO and USB devices, but it seems probable. The cost shown here is only for the magicJack plus 2014, not including the cost of electricty per year for the modem, router, UPS or phone.